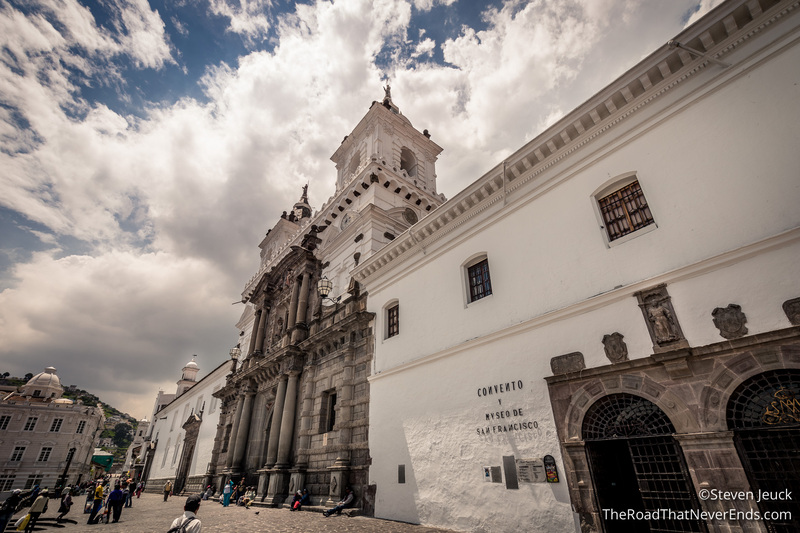 We spent five days in beautiful Quito, and had an amazing time. 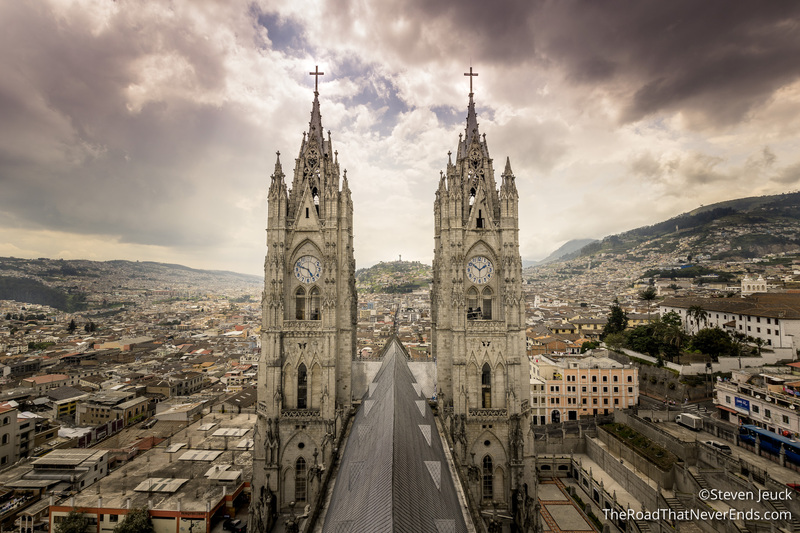 Quito is surrounded by mountains and volcanos, making it one of the most scenic cities we have been to. It is also 9,000 feet above sea level, which was a bit challenging for both Steve and I. We rented an apartment on AirBnB just outside the Mariscal Square. Our apartment included in washer/dryer which was awesome! The area we were in had plenty of restaurants and was close to the bus lines. Overall, really happy with our choice of locations and the apartment. Also, the apartment had a doorman and electronic key to operate the elevator, which made us feel very safe. Frida Tacos – We were excited to see a Mexican style taqueria was nearby our apartment, and had stellar reviews on TripAdvisor. We haven’t had a street taco since leaving the Bay Area. These tacos did not disappoint and the margaritas were AMAZING too. 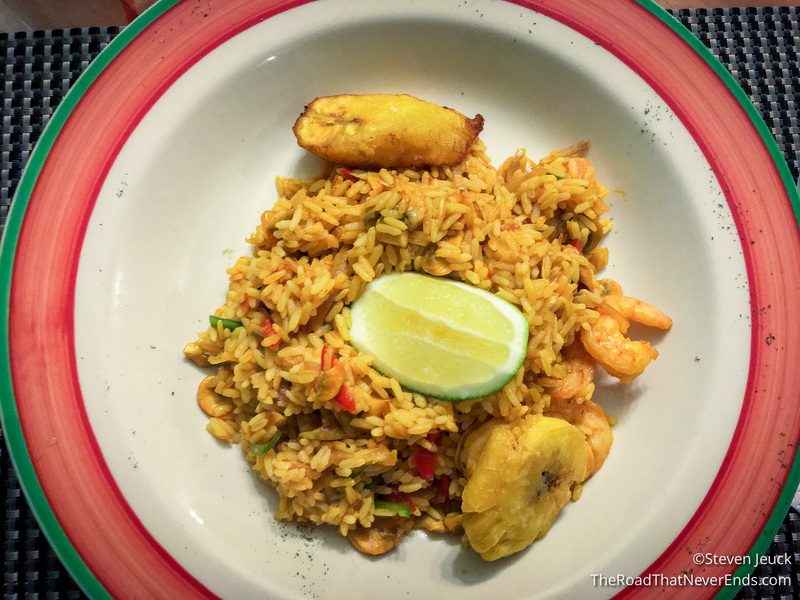 Fried Bananas (Restaurant) – We had to check this place out. 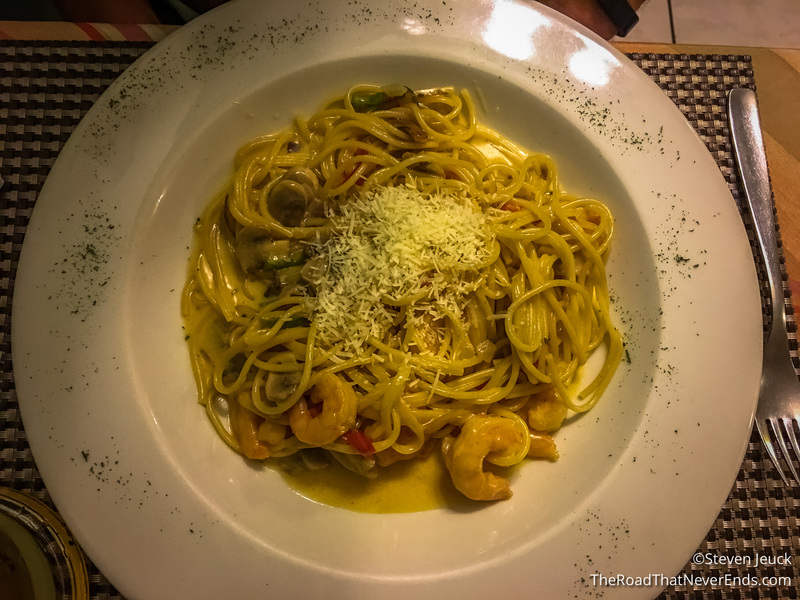 It had fantastic reviews on TripAdvisor, and is well known for their Ecuadorian style food. I had the shrimp and rice, and Steve had the pasta and shrimp. 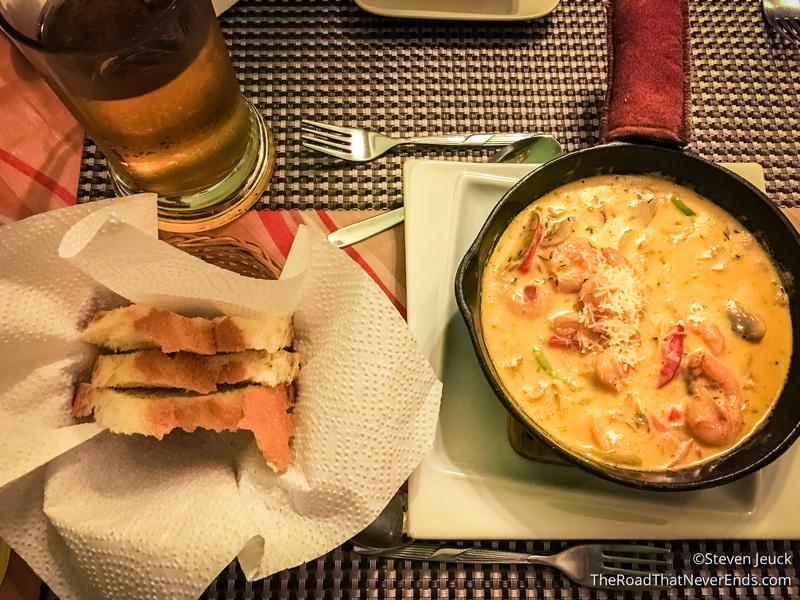 We loved our dishes and the atmosphere! One day we headed to the Equator and took the city bus to get there. It took two separate busses and 90 minutes to get there, but we made it. We had read in several blogs that pickpocketing is pretty bad here, especially on the busses, but it seemed to us that most people were just trying to get where they were going and kept to themselves. The first double-long bus was slammed with people and it was standing room only. On the second, much shorter bus, we managed to get a seat. We didn’t see any theft, nor did we feel unsafe on the buses. The best part was that it cost less than $3 for the both of us, roundtrip. That sure beats a $30 taxi ride! We also made use of Taxis here as they do not have Uber. The Taxis here are meter based just like in the US and unlike most other South American cities we have been in, they actually use the meters. Towards the end of the trip, Steve found an App, CitiyTaxi, that is similar to Uber in the sense you can book a taxi and pay by credit card. Finding a taxi is really easy here. When they see foreigners walking, they will slow down and honk at you, just to let you know that they are there and available for hire. This made it super convenient when we were looking for a taxi, but super annoying when we just wanted to walk somewhere. Iglesias de San Francisco – Originally built in 1537, it has gone through different eras of renovation. Today, you can view the sheer beauty of the church both inside and out (but no pictures on the inside). 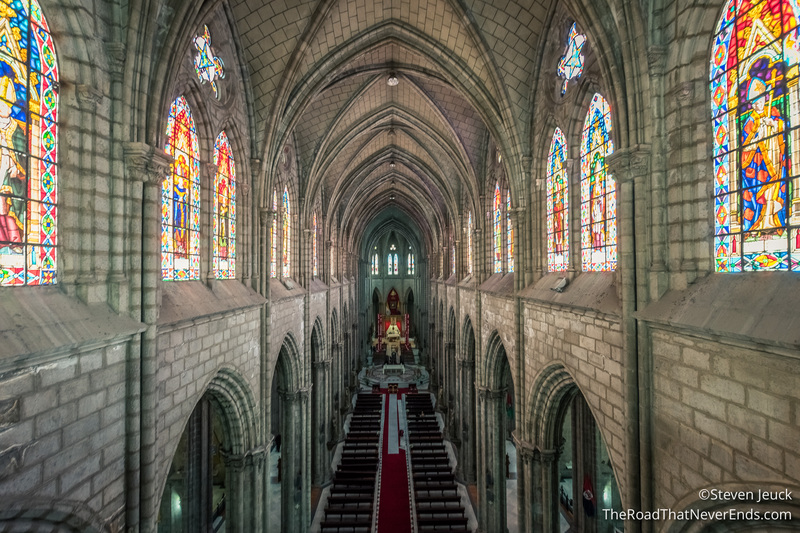 The church also has an adjoining museum, which houses over 3,500 art pieces. 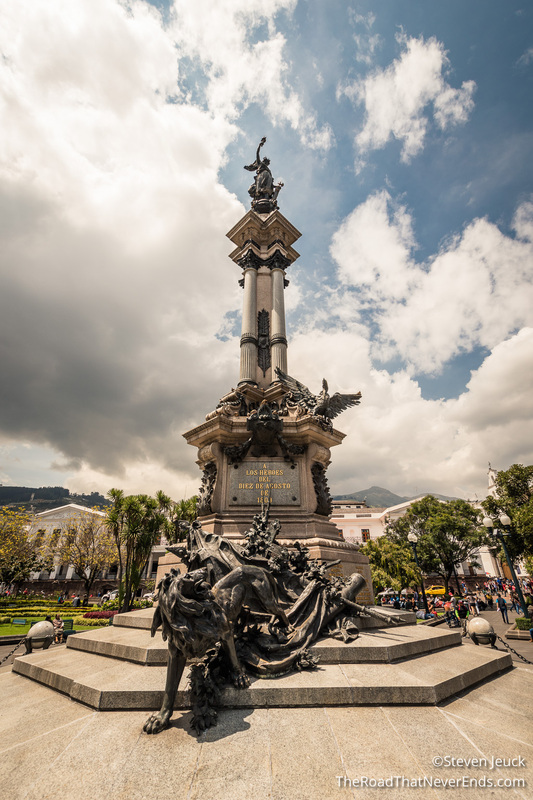 Plaza de de la Independencia – Located in Old Town, the plaza is where the executive power of the nation is. In the center of the square is the monument to the heroes of the independence. The square is flanked by the Carondelet Palace (seat of government and home of the President), the Metropolitan Cathedral, the Archbishop’s Palace, the Municipal Palace and the Hotel Plaza Grande. 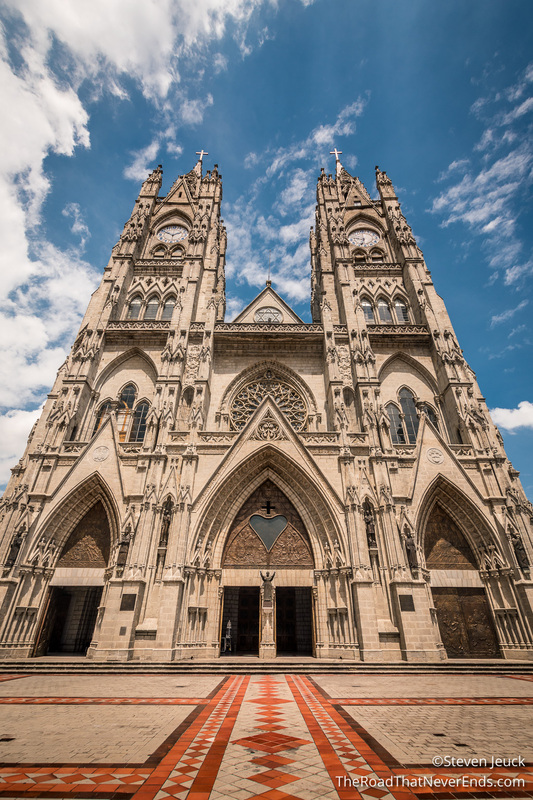 Basílica del Voto National [Basilica of the National Vow] – This beautiful neo-gothic church was finished in 1924, and is often compared to Notre Dame Cathedral in Paris. Steve and I enjoyed walking the grounds of the church, and for $2.00 each, were able to climb the towers of the church. It was well worth the $2, because some of the climbing, although a little sketch, was unlike anything available to do in the US or Europe (for safety reasons I am sure). 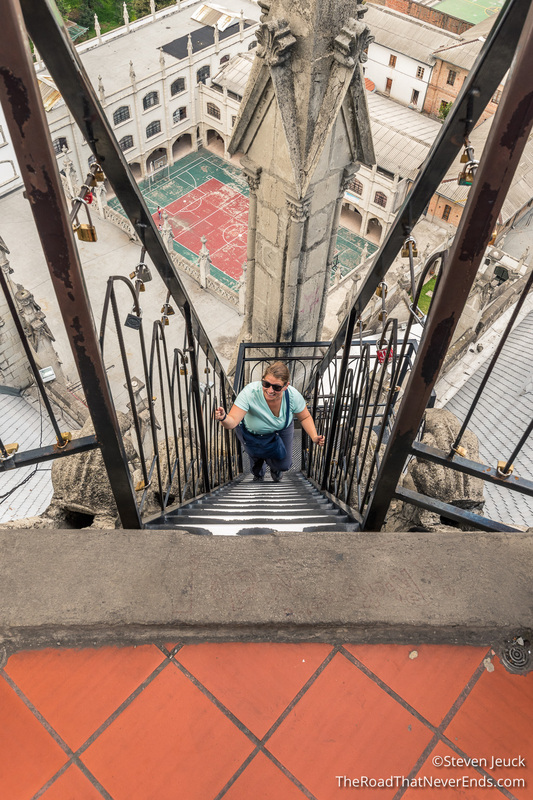 We climbed up to the top of the highest point in the church and walked across a rickety wooden walkway that spanned the length of the sanctuary. For an additional $2.00 each, you can explore the inside of the church. 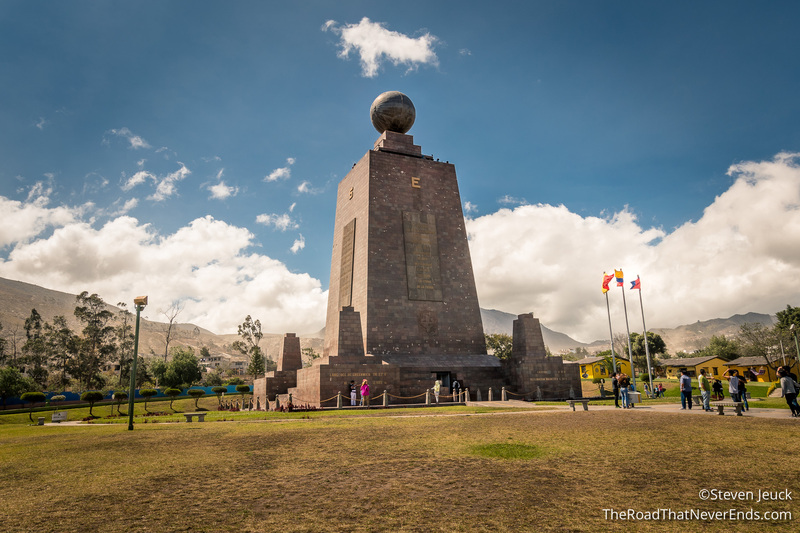 La Mitad del Mundo – This government monument was built in the late 1970’s/early 1980s, to mark the equator line. 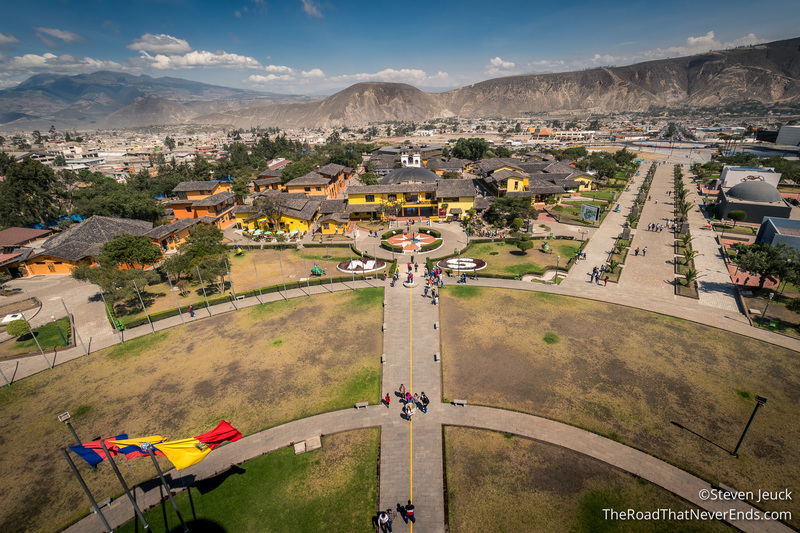 For $7.50 each you can go inside the tower, take in beautiful views, and go through exhibits about indigenous inhabitants in Ecuador. Sadly, as technology has improved, it has been proven that the actual true equator is about 200 meters North of the monument. Steve and I did enjoy taking the pics at this equator line, and checking out the museum. We had made a new friend, Mick, on the bus ride, and enjoyed his company as well. Museo de Sitio Intiñan– This private museum is supposedly at the equator line, although there is some debate about that claim. Here for $4.00, you get a guided tour of the indigenous museum, huts, and see actual shrunken heads, as well as a show of tricks along the equator line. Some of the tricks include: showing how water runs differently on either side of the hemisphere, and balancing an egg on a nail. After some research online, some people have speculated that it’s all an act, and not real. Either way, I found myself entertained, enlightened and engaged. Plus, had some great photo opportunities. I would recommend this museum over the monument. (Steve thought this was cheesy and fake, but still preferred it to the government monument). Volcán Pichincha – We decided to take the cable car line up to a summit for a better viewing of the Pichincha Volcano. 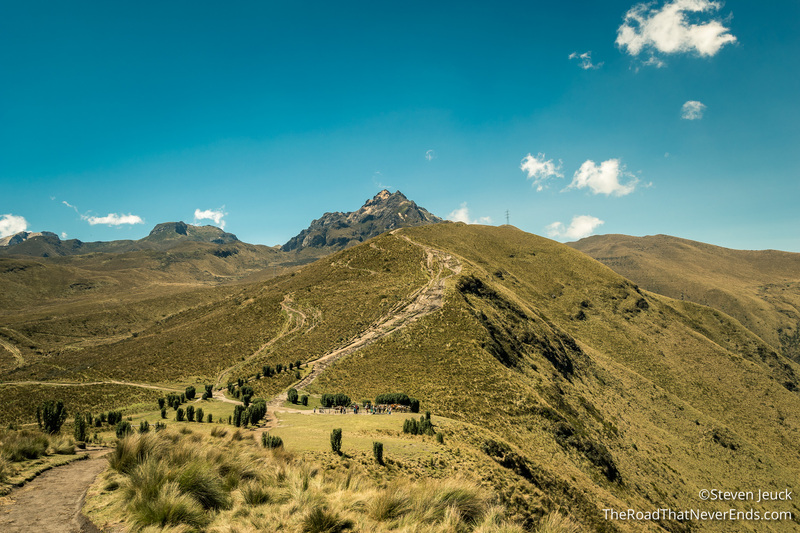 Pichincha has two peaks, with the highest peak being over 15,000 feet. We were able to get great viewing points of this volcano as well as Cotopaxi. Steven and I started to climb the volcano trail, but at 11,000 feet, we weren’t feeling too hot and decided to stop and turn around. We still enjoyed a few hours walking around smaller/lower trails and taking in the magnificent sights. The cable ride is $8.00 each and includes a round trip. We did witness several people taking the dirt bike path down the mountain, as well as paraglide down. 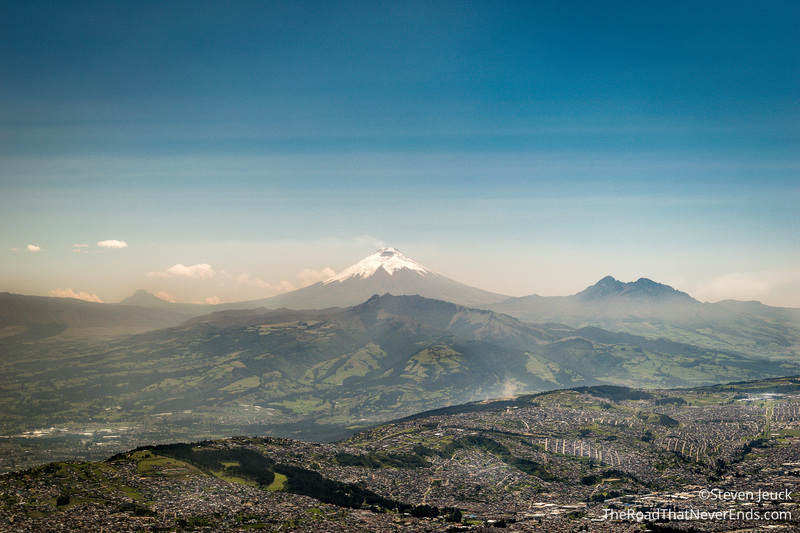 Next time in Quito, I would like to explore Cotopaxi National Park and the surrounding areas. I would’ve loved to done it on this trip, but Steve and I weren’t in Quito long enough to adjust to the altitude. Love to read about the cost of food and what you ate. Like to read about every day experience. Sounds like you are having a great time.